How is this for a prescient prediction from the early 1960s? "As a result of modular and integrated circuitry techniques, all future circuit design work, regardless of degree, will become the responsibility of the component manufacturer instead of the equipment producer." Texas Instruments' (TI) Jack Kilby is credited with designing the first integrated circuit in 1958. The first commercial IC, Ti's Type 502 flip-flop, had just hit the market in early 1960, and already pundits were prognosticating and ruing the disappearance of circuit designers. Maybe it was concerns over job security that they seem to favor forever building every circuit from discrete transistors, resistors, capacitors, and inductors. Rumor has it they also lobbied for the perpetual existence of the buggy whip and horse-drawn farrow inductries. 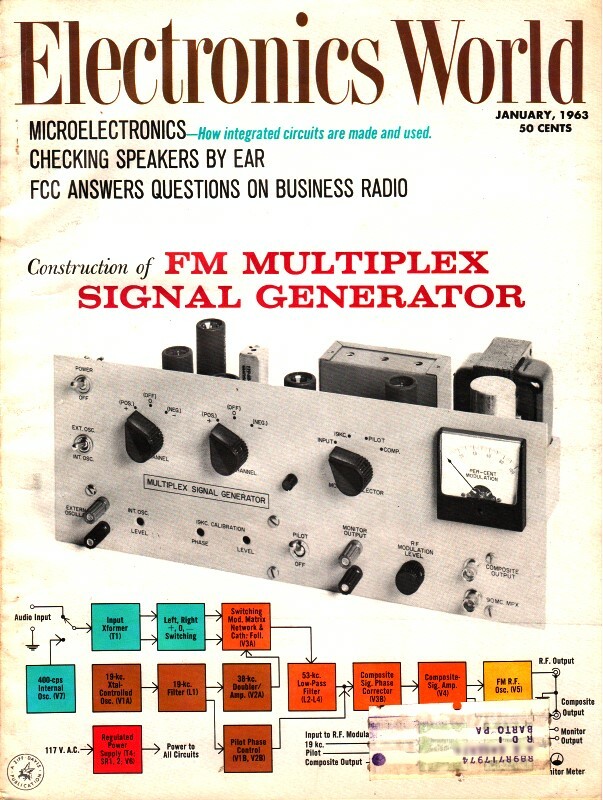 The Edisons, Flemings, and de Forests, of course, are gone, but not many realize that the type of radio engineer of the early 40's is almost as extinct as the dinosaur. Those who are with us today have become specialists or have taken on new titles, such as Systems or Project Engineers. Even the IRE with its 29 professional groups, having a total membership of 81,600, could boast only 6800 members in its professional group on Circuit Theory in 1961. During the last war, the military services recognized the desirability of using a minimum of different circuits and produced various handbooks of "preferred circuits." When digital computers came into being, it was apparent that a few basic circuits would be duplicated many times throughout the equipment and a strong design effort on those few "standard" circuits was warranted. The introduction of printed wiring and plug-in boards further emphasized the need for extremely well-designed standard circuits. Miniaturization and the use of "potted" circuits hastened the trend and now that microminiaturization has brought a variety of circuit packages, the need for standard circuits is even greater. Experimenting with a breadboard circuit is now considered wasteful. If a standard circuit does not yet exist for a particular application, the design of a special circuit or a new standard involves no experimenting. Precise calculations can be programmed on a computer and long before the circuit is actually built, all its characteristics are already known. Construction and extensive tests then merely verify the predicted data. Many former radio engineers and circuit designers have gone into systems engineering, largely because they know what can be expected from all types of circuits, even though the details are not familiar to them. In systems engineering they deal with the proverbial "black box," for which they specify what it must do. Their work is generally limited to defining such basic system parameters as frequency, range, power, performance, size, weight, etc. Another survivor of the old timers' group can be found with a title of "Project Engineer." His concern with technical details is limited to the cost and schedule problems posed by the technical aspects. He is expected to know what the systems engineers have come up with, and appreciate the problems of the various engineering specialists. His primary function, however, is to coordinate all of the various groups. While his technical knowledge is a prerequisite for the job, his real contribution lies in his managerial ability and over-all experience. Fortunately, the basic fundamentals of electronic theory still remain valid, and it is not too difficult for an engineer or technician to change from one area of employment to another. As long as there remains a shortage of qualified personnel, there is no threat of unemployment. To the alert individual these changes should be obvious, but it may come as a surprise that the future holds more drastic changes than the past. As a result of modular and integrated circuitry techniques, all future circuit design work, regardless of degree, will become the responsibility of the component manufacturer instead of the equipment producer. This change is inevitable and the semiconductor manufacturers are in an almost ideal position to take on this extra function. Unfortunately, neither the present electronic circuit designer nor any of the specialists in the semiconductor field is qualified to handle such work. A new breed will eventually evolve-a man whose knowledge embraces electronic circuit design, semiconductor technology, plus manufacturing know-how. At the present time all of these changes are basically involved in the military and, to some degree, in the industrial areas of electronics. Rest assured, though, that in the not too distant future the techniques that are developing in these areas will influence the design of consumer products. Even now much work is being done in applying integrated circuit techniques to television receivers. Engineers and technicians who could be affected by such a change should be alert to the effects this trend may have on their vocation. Even educators, those men who are involved not only in training our future engineers and technicians but those who plan and coordinate their programs, should base their curricula planning on these inevitable changes.